Southern Creek community in Jacksonville, Florida. 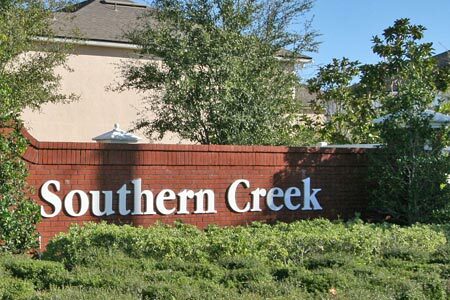 Southern Creek is a new townhome community located in the center of Julington Creek Plantation. This 365-townhome community offers floor plan ranging in size from 1,044 to 1,463 square feet. The amenity center includes a 1,400-square-foot swimming pool, an 800-square-foot restroom pavilion, a poolside cabana and children's playground. Julington Creek Plantation is a master-planned community located in the northwest corner of St. Johns County, encompassing 4,119 acres and more than 12 distinctive neighborhoods with 5,400 completed home sites and room for a total of 6,200 home sites. The community extends east from Florida 13 approximately 3.5 miles on both sides of Race Track Road. St. John's County is one of Florida's major growth areas. St. Johns County Public Schools were recently named by School Match, the country's largest school selection consulting firm as ranking among the top 14% of all of the nations school districts. Moreover, families are moving to St. John's County because of the natural beauty and the accessibility to many businesses and centers of employment. Its close proximity to premier shopping, grocery and specialty stores, beaches, business centers, marinas, schools, airports and family entertainment makes it one of the most sought communities in Jacksonville.